2013 is almost here. Have you made plans to celebrate the New Year yet? If not, may we suggest a trip to Asheville, North Carolina? 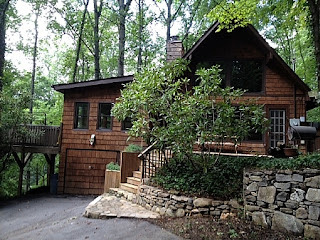 One option is to book a cabin nestled in the Blue Ridge Mountains and spend a quiet night snuggled up by the fire, popping champagne, and spending it with those near and dear to you. Another option is to head out into downtown Asheville and the surrounding area and join in the New Year's fun and festivities. Asheville doesn't offer a public outdoor celebration to ring in the new year, but there are plenty of opportunities to stroll the streets and pop in to the local restaurants, pubs, and clubs. Many of the restaurants have extended hours on this day and offer New Year's specials and celebrations uniquely their own. Tressa's Downtown Jazz and Blues hosts their New Year's Eve All Star Jam with a chance to dance the night away with some of Asheville's finest blues, R&B, funk, Motown, and more. Enjoy complimentary champagne fountains, party favors, complimentary soul food buffet, midnight toast, and a balloon drop. The club opens at 8p.m. and the show begins at 9:30p.m. The event is first come, first served. Pack's Tavern offers a New Year's Eve buffet dinner menu on the upstairs level which includes their signature Pack's Countdown to New Year's Eve Bash. Festivities include DJs, hats, toppers, champagne toast, and more. Enjoy three floors and three bars. The Orange Peel hosts a concert featuring Emancipator plus Shigeto and Marley Carroll. Doors open at 7p.m. and the show begins at 8p.m. Tickets are $25 in advance, $30 the day of the show. The kids get a night to stay up late and ring in the New Year with some fun. Bring them out to Asheville's Fun Depot for a New Year's Eve celebration they won't soon forget. For $15, kids can enjoy three hours of unlimited play from 10p.m. to 1a.m.! The Fun Depot offers arcade games, laser tag, indoor go-karts, and so much more. The diner stays open and live music is planned. Plunge into the new year with style and for a good cause by joining the annual New Year's Polar Plunge at the beach at Lake Lure. Whether you're planning to be a brave participant or a supportive observer, there's plenty of fun to partake of. Bonfires are on-hand to warm you, as well as hot chocolate and cookies. The bone-chilling fun takes place at noon on January 1. Registration for the plunge is $15 and registration occurs from 10:30-11:30a.m. Plungers are encouraged to dress in costumes. Prizes are awarded for best costume, youngest plunger, oldest plunger, and the plunger who traveled the furthest. If you're plunging, remember to bring your water shoes and a towel. If you're a spectactor, you are welcomed free-of-charge. The New Year's Polar Plunge supports local volunteer fire departments. They are willing to sacrifice daily for you, why not sacrifice a little warmth for their benefit? We hope to see you there. Here's a video clip of last year's Lake Lure New Year's Polar Plunge. Enjoy! Lake Lure is located near Chimney Rock State Park. Speaking of the park, it offers a free hike on January 1 at 1p.m. Kick of your New Year's resolution to get fit with a free hike on the newly constructed Rumbling Bald Trail. Wherever you plan to spend your New Year's celebration, we hope it's a fun and safe one. Remember that the new year is the perfect time to start planning for your next Western North Carolina vacation. We hope to see you soon. Happy New Year! Asheville and the surrounding Western North Carolina region is known for its eclectic and trending arts scene whether it's performance arts, arts and crafts, visual arts, music, or dance—you can find it all here. The holiday season is no different. Here are some of the seasonal performances you can find now playing and continuing through the holidays. Now playing through December 30, Jacob Marley's Christmas Carol is showing Wednesdays through Saturdays at 7:30p.m, and Sundays at 2p.m. at the North Carolina Stage Company in downtown Asheville. The production is presented by the Ensemble Theatre Company. Jacob Marley's Christmas Carol shifts its focus from Scrooge (since we all know how his story plays out) to his old business partner, Jacob Marley. 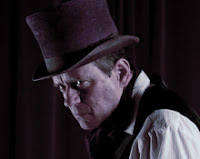 With a twist on the classic, this production is a darkly funny and deeply touching play by Tom Mula where the audience sees Jacob Marley's heroic efforts to save Scrooge's soul, while in the meantime also saving his own. Admission prices are $20 for adults, and $10 for students and children. Tickets for Jacob Marley's Christmas Carol can be purchased online here. Rediscovering Christmas is a BMCA tradition that has captivated audiences with its funny, moving tale. Enjoy an evening of professional theater combined with delightful Christmas music all taking place in an intimate setting in downtown Black Mountain. 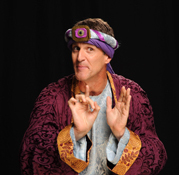 This production is brought to you by Jim and Carol Shores of Acts Renewal Theatre Company. The show is a series of vignettes with the purpose of welcoming young and old to rediscover the wonder of Christmas. The audience is presented with a comedic tale of two blue collar shepherds in the right place and the right time on Christmas Eve to the true touching story of an Appalachian single mom seeking a Christmas miracle. The evening finale includes an irrepressible Jamaican wiseman who gives his rendition of the Christmas story in a way we promise you've never heard before. For those returning for this year's production, there's always a new play filled with surprises. Live music and sing-along carols are presented by the Holly Hoppers. Show performances are on Friday, December 21 and Saturday, December 22 at 7:30p.m. Tickets for Rediscovering Christmas are $15 and reservations are highly recommended. These are only a couple of the seasonal performances occurring this week, but you can find a full listing of events at ExploreAsheville.com. 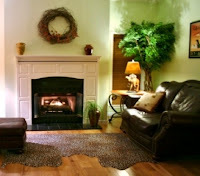 Don't forget that there are vacation rentals throughout Western North Carolina available to make your stay ideal. Choose a cabin nestled on a mountaintop with breathtaking views or choose something closer to downtown Asheville that's set right in the midst of all the action. The choice is yours! 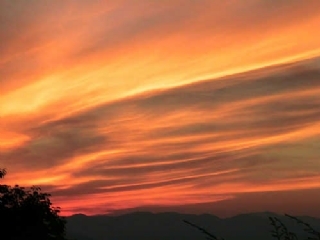 We hope you are planning to visit Asheville and the surrounding Western North Carolina area in the very near future. Happy Holidays! It's mid-December already, and it's hard to believe that the holidays will be here in a few short weeks. We hope you'll consider getting away for a few days in the mountains of Western North Carolina. Whether it's before, during, or after the holidays, we'd love to see you here. If you happen to be in and around Asheville and the surrounding Western North Carolina region this week, here are some of the special seasonal events that are sure-to-please. Check them out! It's a holiday classic that must not be missed! 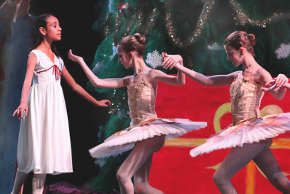 The Ballet Conservatory of Asheville presents The Nutcracker on Wednesday evening, December 12 at 6:30p.m. and on Thursday and Friday, December 13-14 at 5p.m. and 7:30p.m. The performances take place at the Diana Wortham Theatre in Asheville. With over 100 performers on set, this performance combines the artistry of dance and storytelling amidst the lavish sets and costumes. Ticket prices range from $10-$25 and sell out quickly, so don't delay. You can purchase online tickets for The Nutcracker here. Santa can be spotted in and around Asheville this weekend. His first stop is at Asheville's Fun Depot on Roberts Road in Asheville on Saturday, December 15. From 9-11a.m., come and enjoy a free pancake breakfast with Santa which includes a feast of pancakes, orange juice, and coffee. Bring your cameras! 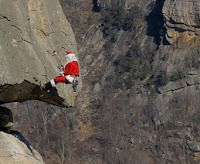 Hmmm, ever wonder how Santa has become so swift and proficient at chimney climbing? Well, this explains it. Come on out and see where Santa practices his daring feats! Witness firsthand Santa's stunts as he practices on Chimney Rock at Chimney Rock State Park. It's one of the world's largest chimneys looming at 315 feet! Also enjoy meeting Santa and Mrs. Claus all while indulging in complimentary hot cocoa, cookies, kids' activities, and observing live critters. There's live holiday music, too. All of these activities are free with paid park admission and run from 11a.m. to 2p.m. on Saturday, December 15. You can check out a preview of Santa on the Chimney here. Mmmm, who doesn't love cookies? Cookie lovers must come to Black Mountain this weekend for the 2nd annual Vision of Sugar Plums Cookie Tour. Guests can enjoy beautiful decorations, unique and delicious cookies, and a take-home recipe book. Establishments included on the tour are the Red Rocker, The Madison Inn, the Inn on Mill Creek, The Monte Vista Hotel, and the Black Mountain Chamber of Commerce Visitor Center. Tickets are $10 and are available in advance at the visitor center. Tickets are also available at all of the participating locations during the event. It's a fantastic time to come to Lexington Avenue in downtown Asheville for a unique shopping event. On Saturday, December 15 from 10a.m. to 5p.m. and Sunday December 16 from 11a.m. to 4p.m., 25 artists are on-hand selling their handmade works of artistry. Find that perfect gift for each of the special people in your life while gaining the satisfaction of knowing that you are buying local and supporting local merchants. You won't regret it! We hope this helps you with your planning for your time in Western North Carolina this week. There's always plenty to see and do no matter what time of year you're here. We hope to see you soon! 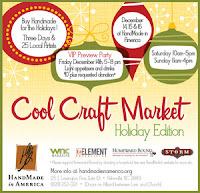 Have you been to any holiday events in Asheville or the surrounding Western North Carolina area? We'd love to hear about it. Tell us about it in our comment section! Come to Asheville this weekend for a nice blend of arts, culture, and chocolate! On Saturday, December 8 from noon to 7p.m. at the US Cellular Center, the Asheville Chocolate and Arts Festival offers chocolate samples, family-friendly world music, dance performances, a fashion show, and much more. There are also free workshops on drumming, dance, improv, and storytelling. 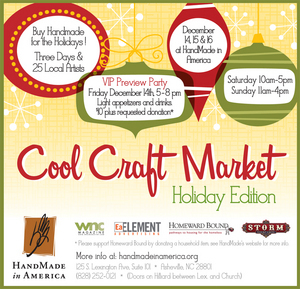 It's a great opportunity to do some holiday shopping as well as guests can access the local and international artisans market. A percentage of the proceeds benefits a good cause, so it's another reason to come on out the festival. Local non-profits such as the Odyssey Community School scholarships for arts education, the Kids at Work! culinary arts program for at-risk youth, and the Urban Institute for youth dance and film. Students from each of these organizations participate in the various levels of the the festival's productions and performances. Now, back to the chocolate. Local chocolate providers in and around Asheville represented at the festival include the French Broad Chocolates, Ulimana Raw Chocolate, Raw Shakti Chocolate, Sinless Raw Chocolate, Choffy cacao drinks, Raw Herbal Chocolates, and many more. You can see the complete list of chocolate providers here. There are also several gluten-free bakeries and confectioners on-hand as well. 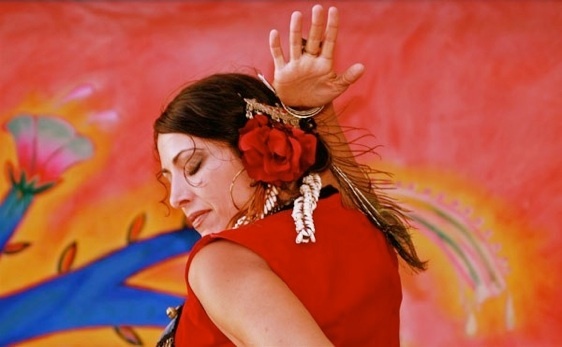 As a celebration of multicultural arts, the Asheville Chocolate and Arts Festival features local and regional performers, musicians, dancers, baskets and basket weaving demonstrations, cultural arts and education by members of the Cherokee Nation, Bellydance, African dance, Argentine Tango, Hip Hop and more. There's a lot to see! Performers are also teaching classes in drumming, bellydance, Tango, West African dance, and digeridoo throughout the day. (Hey, it's a great way to burn off some of the calories you consume at the festival.) Children's performance artists are at the festival as well providing balloon twisting, face painting, and dance workshops. It's truly a family-friendly event. All of these activities are included in the ticket price, which is $18 for adults, $8 for students, and free for children under 10 on the day of the event (plus a $2 utility fee). Additional ticketing options can be found here. Speaking of sweet treats, on Saturdays in December Laughing Mask Candies on Lexington Avenue in Asheville hosts gingerbread-house-making classes. Yum, yum! It's a chance to perfect your technique and try your hand at creating some seasonal delights. Space is limited and classes fill up fast, so make your reservations now! You can find out the full details here. This a wonderful time of the year to be close to all of the seasonal events occurring this month in Asheville. Make your stay more convenient by choosing vacation rentals right near the heart of Asheville and save more time for the fun! Have you spent time some time in Asheville in December? Where did you go? What did you do? Tell us about it in our comment section. We always love hearing from our readers!